I got a few cranky emails after my post suggesting the United States should copy the Baltic nations and implement genuine spending cuts. These less-than-friendly pen pals were upset that I favorably commented on the fiscal discipline of Estonia, Lithuania, and Latvia while failing to reveal that these nations were suffering from high unemployment. From the tone of this correspondence, my new friends obviously think this is a “gotcha” moment. The gist of their messages is that the economic downturn that hit the Baltic nations is proof that the free-market model has failed, and that I somehow was guilty of a cover-up. That’s certainly a strange interpretation, especially since I specifically noted that the three nations had suffered from an economic downturn. 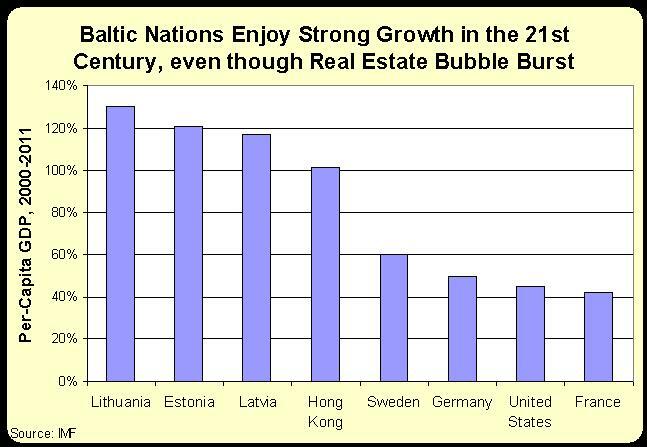 There’s no questioning the fact that unemployment spiked upwards because of the global financial crisis, which was especially damaging to the Baltics since they all had real estate bubbles. But let’s deal with the bigger issue, which is whether this downturn is proof that the free market failed (and, for the sake of argument, let’s assume that all three Baltic nations are free market even though only Estonia gets high scores in the Economic Freedom of the World rankings). If you look at the IMF’s World Economic Outlook Database, it does show that the Baltic nations had serious economic downturns. Indeed, if we look at the data from 2008 to the present, the recession was far deeper in those nations than in Western Europe and North America. So at first glance, it seems my critics have a point. But what happens if you look at a longer period of data? The IMF has data for all three Baltic nations going back to 1999. And if we look at the entire 12-year period, it turns out that Estonia, Latvia, and Lithuania have enjoyed comparatively strong growth. Indeed, as seen in the chart, they even surpass Hong Kong. In other words, the Baltic nations may have suffered larger-than-average economic downturns, but they also enjoyed stronger-than-average booms. And the net effect is that they are now in much better shape than the nations that had smaller recessions but also less-robust growth. A sophisticated critic may look at this data and say it’s meaningless because convergence theory suggests that middle-income countries almost always will grow faster than rich nations. That’s a fair point, so let’s now compare the three Baltic nations to three other nations that were at the same level of development at the turn of the century. 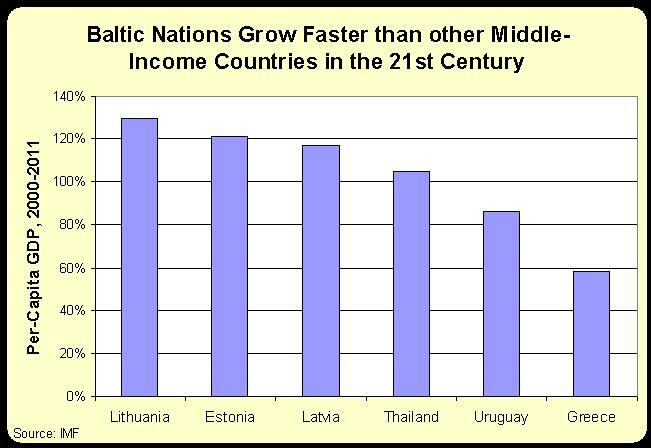 As you can see, the Baltic nations are doing substantially better than other middle-income nations. By the way, skeptics should feel free to peruse the IMF data to confirm that I didn’t cherry-pick nations to make my point (indeed, I deliberately picked Thailand since it was emerging from the Asian financial crisis and is an example of a nation that enjoyed very good growth in the 2000-2011 period). The point of this post is not that the Baltic nations are perfect. Estonia is ranked 12th in the Economic Freedom rankings, which is impressive, but Lithuania is 33rd and Latvia is 55th. Those aren’t bad scores considering that these nations are recovering from communist tyranny, to be sure, but Hong Kong isn’t in any danger of being dethroned. Instead, my argument is that the Baltic nations are making slow but steady progress, and I’m quite confident that the recent decisions by these nations to reduce the burden of government spending will help put them back on an above-average growth path. That is something America should emulate. In fact PREDICTABLE inflation -like under a crawling peg to a super currency- may not be a problem and it is absurd to give the same weight to inflation than to tax financed government spending, but both Heritage and Fraser may do that mistake. I think government spending as a % of the GDP is the best simple figure to measure serfdom in democratic societies and european tax hells are very oppressive societies. But the Heritage Index tells us that tax hell Denmark -more than 50% of GDP government spending- is Nr 8 in economic freedom while Denmark growth is one of the lowest in the world, at least in the 2002-08 period that I computed while the baltic countries have an outstanding growth in that period. I think there is a huge bias IN FAVOR of tax hells and AGAINST tax havens in (keynesian) GDP figures because of the way in which they account exports and substract imports and do not take into account capital gains and, moreover, in (keynesian) GDP figures government spending appears roughly twice. So super exporter China growth may not be as spectacular as GDP figures show, but even accounting for that China’s growth is spectacular.